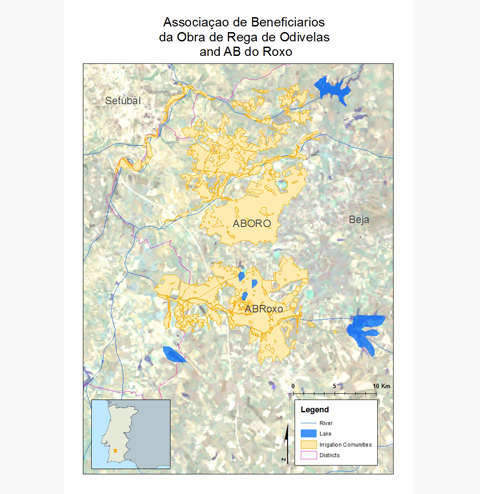 ABORO: The Associação de Beneficiarios da Obra de Rega de Odivelas is in charge of Odivelas irrigated perimeter, 1st and 2nd Phases, benefiting approximately 12.362 ha, is located in the basin of the Sado river, near Ferreira do Alentejo. The 1st phase of exploration began in 1974, covering an area of 6700 ha, with water supply in gravity. In 2004 was completed the 2nd phase of the irrigated perimeter of Odivelas, benefiting about 5446 ha, with distribution of pressurized water. In 2006, under the process of rehabilitation and modernization of Phase 1, began the exploration of Block 3 of Odivelas, which benefits an area of 1.724 ha. This area has been modernized by distribution of water under pressure. Currently, in the area with pressure distribution, the perimeter has four pumping stations with 12.000 KVA of installed power and a pumping capacity of 7.000 l/s. The water supply comes from the Odivelas reservoir (96hm3). ABR: The Associação de Beneficiários do Roxo is in operation since 1968. The study area is located in the Sado River Basin in Montes Velhos near Beja. The command area is about 5000 ha, of which 1800 is served by a pressurized system and the rest the water us supplied by gravity. The irrigated area is undergoing changes to more intensive and modern irrigated agriculture. Considering the increased cost related to pressurized water, it is very important to use water and energy as optimal as possible. The farmers need to optimize the use of their inputs, of which water is one. Both reservoirs, Roxo and Odivelas, are connected to the Alqueva Dam which is in the Guadiana river. This provides security for water supply and the irrigated agriculture area can now be further developed since there is a dependable water supply.